Trump’s speech to Congress was as amoral as the man himself. 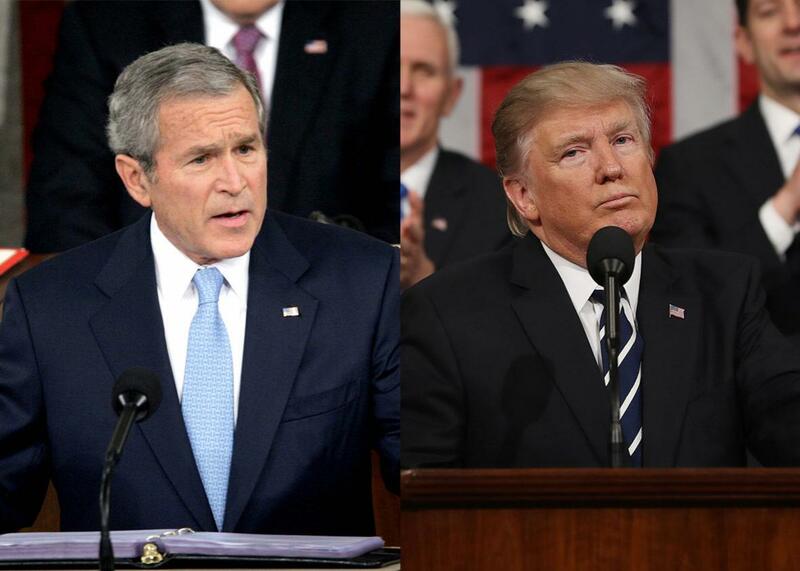 President George W. Bush in 2007 and President Donald J. Trump in 2017 addressing Congress at the U.S. Capitol in Washington. President Trump won praise for his speech to Congress on Tuesday night. “Trump Offers Up a More Hopeful Vision,” said the New York Times. “Surprisingly presidential,” said the Washington Post. CNN’s poll gave him a thumbs-up: “7-in-10 speech-watchers say Trump boosted optimism.” Few seem bothered by what the speech lacked: traditional invocations of altruism, self-restraint, or any other principle. This was an appeal to ruthless tribalism. It’s who Trump is. It’s what we, in applauding him, are becoming. Trump is so relentlessly amoral that it’s easy to forget what used to count as presidential. One useful measuring stick is the previous Republican president, George W. Bush. You can fault Bush for many things, and I have. But Bush accepted modern ethics. He believed in universal worth, human rights, and a concept of justice that transcended civil law. Trump shares none of these beliefs. Bush urged lawmakers to be “good stewards” by protecting the environment. Trump advocated pipelines and coal mines. Bush called for teaching children “right from wrong.” Trump spoke only of advancement and jobs. Bush said leaders should serve their consciences. Trump said they should serve commerce. Bush proposed, “Much has been given to us, and much is expected.” Trump said we should “expect our partners” to give more. Trump’s hollowness is self-defeating. By walling off channels between America and the world—aid, trade, immigration—he would rob our country of its distinctness. He would destroy, not protect, our national identity. “Those given the high honor of admission to the United States should support this country and love its people and its values,” Trump declared. If only he understood what those values are.